Despite the miserable weather this weekend having the polytunnel meant we were able to get on with planting our garlic. We’ve bought four different softneck varieties from The Garlic Farm on the Isle of Wight: Solent Wight, Early Purple Wight, Albigensian Wight and Iberian Wight. We’ve planted the garlic in a single bed in the polytunnel. Planting each clove 4 cm deep and 6 inches apart. When we first planted the herbs out in the polytunnel beds we had to use the tractor rotavator to cultivate the soil and we’ve been plagued by weeds and grass regrowing in those beds. The area for the garlic bed was very different though. 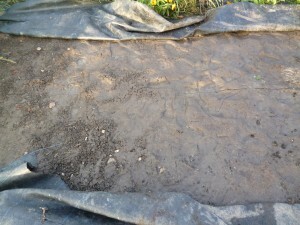 It’s been covered by a plastic water and air permeable ground cover since April, as has all of the area within the polytunnel, and as a result there are no weeds or grass. The area has been watered regularly by the overhead system so was moist and easy to dig over. Here’s a picture pre dig. With our fairly heavy soil water logging leading to rotting of the garlic is a risk so we’re just going to grow it in the polytunnel where we can control the environment. Garlic can be planted twice a year in Autumn and Spring. December is probably the latest you can get away with planting the Autumn varieties but Spring planting varieties such as Solent Wight, Tuscany Wight, Picardy Wight and Lautrec Wight can be planted from January. Spring planting continues right through until April. The first green garlic harvest from autumn plantings should be from May onwards. 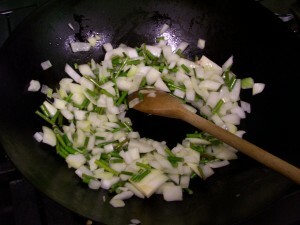 Green garlic is garlic that has been harvested young before the cloves have fully formed. 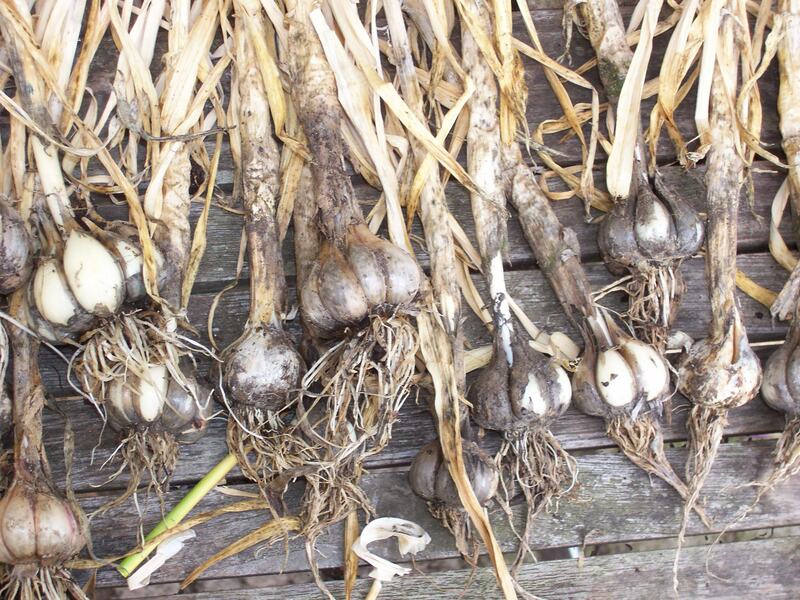 The bulb is eaten whole and has a milder flavour than fully grown garlic. So far I’ve planted only soft neck garlics. Hard neck and soft neck refers to the flower stalk. Soft neck garlic is the most common type of garlic found in the shops mainly because it stores better than hard neck garlic. 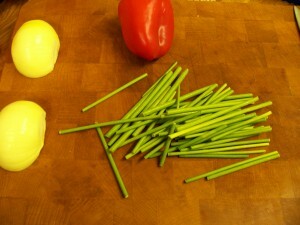 As an added bonus the soft neck of the garlic bulb can be cut long and braided making an attractive way to store your garlic. 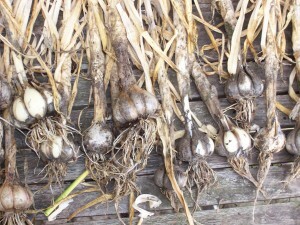 Hard neck garlic are closer to wild garlic and are said to have more complex flavours. The down side is that they do not store as well. There are a variety of diseases and parasites than can affect garlic some of the more common ones are. Onion Fly which lays its eggs close to or on the plant. When hatched the maggot bores into the bulb and it collapses. Growth halts and the neck of the plant thickens. Keeping the soil around the plants well cultivated between March and May will offer some protection. Rust which presents as small orange blisters on the leaves of the plant from May onwards. Increasing levels of potash hoed in around plants in February will offer some protection as will spraying regularly with sulphur compounds or Dithane. Stem and Bulb Eelworm leads to gradually increasing numbers of plants failing throughout the growing season. Eelworm is a soil borne nematode hosted by other garden plants. 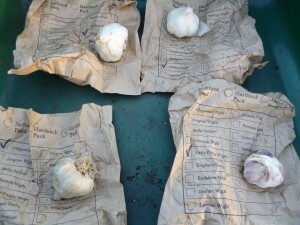 Apparently some control can be achieved by treating soil with Jeyes fluid before planting the garlic. White Rot occurs where there is a history of allium cultivation as it is soil borne. Again plants will gradually fade away April -June and the bulb becomes white dust. As the disease progresses a white cottony fungal growth with black dots is visible. To prevent further problems destroy all infected material and avoid using that area for growing alliums for 15 years. There haven’t been any vegetable crops grown in the area where our polytunnel is and, apart from the herbs I’ve planted, the main plants nearby are grasses so hopefully we won’t have too much of a problem with pests and disease. We will also plan a rotation for the vegetable beds in the polytunnel which should minimise any problems. While in the polytunnel planting my garlic I had a peek under the fleece at the tender herbs and cuttings. I mentioned last week that the plants all seemed to be doing well. Well this week the Blackcurrant Sage (Salvia microphylla) and (Salvia elegans) have been doing so well they’ve started flowering. 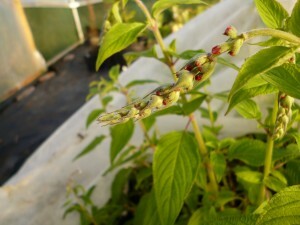 Here’s the pineapple sage buds just about to open. Today we harvested our garlic. Not quite as large as the monster bulbs my parents in law grew which I posted about recently, but hopefully just as tasty. I’d experimented with putting several bulbs in some pots and only one or two in other pots. As you might expect those that were less crowded grew bigger but hopefully they will all taste as good. We’ll dry the bulbs and then use them over the next few months. As well as harvesting the garlic I picked the last of my peas (more on that to come) which has left me with a few gaps to fill. For the first time I’m going to try growing some greens through the autumn and winter. I’ve done my first plantings today and I’ll plant some more over the next few weeks, hopefully this will mean we get a steady supply rather than a massive glut all at once. Chinese cabbage ‘Tatsoi’ a loose headed variety with flat open habitat and spoon shaped dark green glossy leaves. Chinese cabbage ‘Green rocket F1’ a cabbage with a tall cylindrical head, bright green leaves and a long storage life. I’ve planted some directly in the containers that had my peas in and a spare potato container. 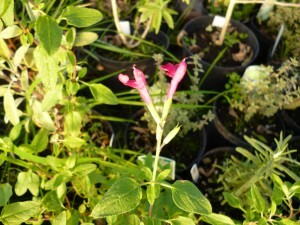 I’ve also planted some in modules ready for planting out into other containers as they become empty following harvest. Hopefully they’ll all take and we’ll have a steady supply of greens throughout the autumn and winter. Together with the purple sprouting broccoli ( aka the triffids- seriously the are enormous !) and leeks the garden should have quite a bit of greenery in it and be very productive right through the dark days of winter. As I mentioned in my post about Garlic, in China the flower stalks are used in cooking. Having taken the stalks off our garlic in preparation for harvesting in 2 weeks we thought we’d have a go at cooking with them. I think if we had used them sooner, when the stalks first shot up, they would probably have been less woody and more palatable. A different cooking method might have tenderised them a bit more as well. Although not really edible you could use them to add garlic flavour because they were very very garlicky.